Why do we show our love to those we care about with presents that will hurt the environment, like balloons and candy or flowers that are wrapped in plastic? It does not have to be that way – for some Earth-friendly ideas read on! In the United Kingdom more than £500 million a year is spent on Valentine’s Day, with much of the packaging going straight into the bin, and then as is the case of balloons and plastic wrap that can’t be recycled, directly to landfill. Balloons are pretty, but oh-so-bad for the environment and for our wildlife. 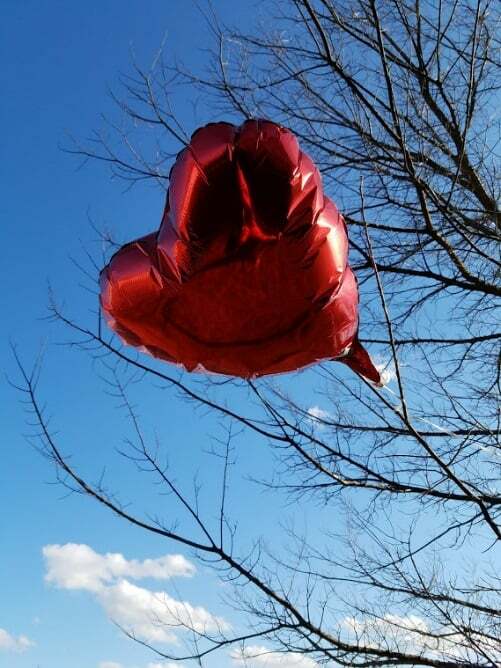 And as for the habit of releasing balloons into the sky – if you love them, don’t let them go! What goes up will come down, and when it does, it will be litter and may also kill countless creatures through ingestion, entanglement or strangulation. And let’s not forget the possibility of getting stuck in power lines and the resultant outages. All you seed is love! Handmade plantable cards that are seeded with wildflowers make for a wonderful alternative to traditional cards. Buying these cards helps to support local artisans and planting indigenous wildflowers in your garden or in pots will help to support pollinating insect populations. Bees are particularly in need of some all-year-round TLC right now! Beyond wildflowers, nothing says that you are in it for the long term like the gift of seed paper that will grow into a tree when planted! Made from residual cotton from the textile industry, this seed paper doesn’t require trees to be cut down nor does it involve toxic bleaching — it is said to be a 100% sustainable product that ends up germinating into a plant at the end of its life. Choccies to show your love that won’t add an inch to your beloved’s hips? The seed paper idea has evolved and diversified to the point where a “sowing kit,” “earth pills”, and “plantable chocolates” are now among the products being to help make a difference. Think about both people and planet before you buy. Your gift can support local artisans with an offering to your loved one that is not only beautiful and delicious but also unique. Before you buy do a bit of thinking and if you need asking, about the both product and it’s packaging. Is the packaging recyclable? Better yet, is it compostable so that it will return to nature once its job is done?